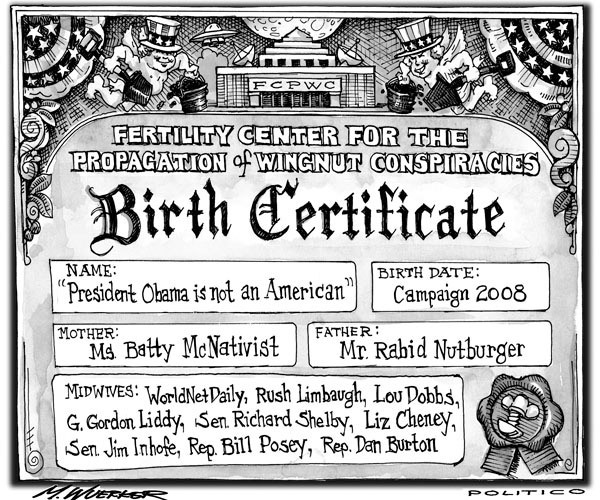 Any reasonably sane person will admit this ‘birther’ movement is comprised entirely of nut jobs. I understand in any number of circumstances, calling activists ‘nut jobs’ does quite a bit to damage the activist voice, from either side of the isle, in a country dominated by a sensationalist new media which picks and chooses its message. Still, it seems everyone but the very, very far right group of insane people can agree that this claim that Obama wasn’t born in Hawaii is distracting responsible people, as well as the news media, from more important issues… like health care reform! Admittedly, I haven’t paid real close attention to the ‘birther’ news cycle simply because its a stupid argument to make. Its been proven. Its been proven more than once. And don’t even get me started on self-proclaimed ‘Mr. Independent.’ Lou Dobbs is a right-wing groupie posing as a responsible journalist. You think I’m wrong? Hell, even FOX’s Bill O’Reilly lends no credence to the ‘birther’s’ claims. There’s a small part of me that just feels sorry for these ‘birther’ people who can’t seem to find a better outlet for the frustration. Or for their insanity.